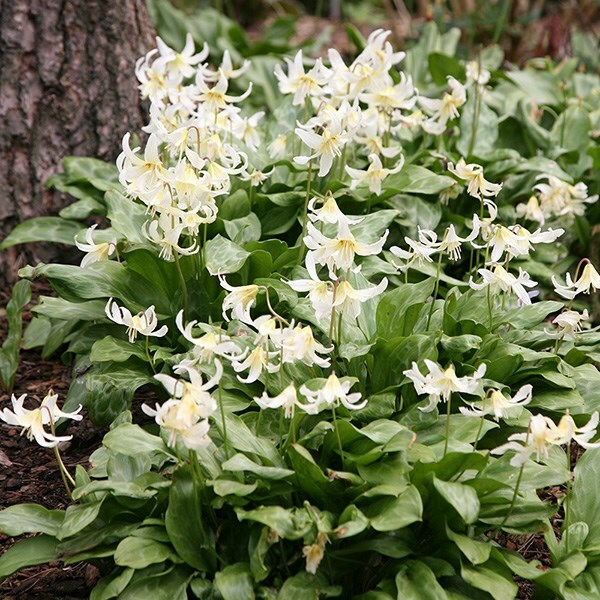 These look wonderful when allowed to form naturalistic drifts in a woodland setting, and as they are reasonably vigorous in nature, they are also one of the easiest to grow. Their leaves, which form a basal clump, are softly marbled, and it is from amongst these that the slender stems rise up in spring, each bearing up to 3 nodding white flowers. These are made up of strongly recurved and pointed tepals (petals), that surround a prominent cluster of white stames. A truly elegant plant in every way. Garden care: Plant bulbs 10 - 15cm deep and 10cm apart in naturalistic drifts where they can be left undisturbed for several years. Try to avoid planting under shrubs or trees that will soak up all the soil moisture in the summer.